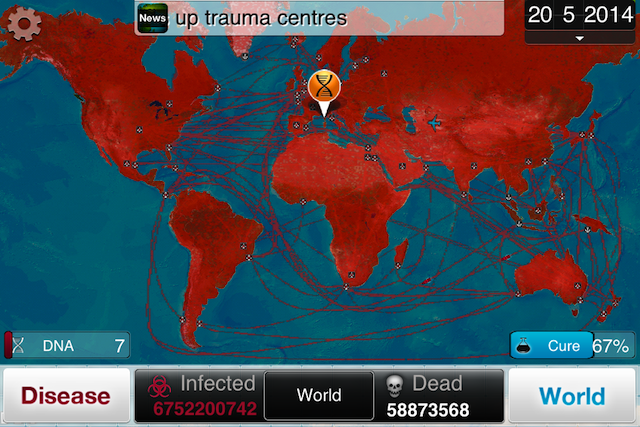 Spread Your Disease Around The World With Plague Inc.
Plague Inc. ($0.99) by Ndemic Creations is a pathogen-spreading strategy game where your goal is to wipe out the human race by sending a killer disease throughout the world. 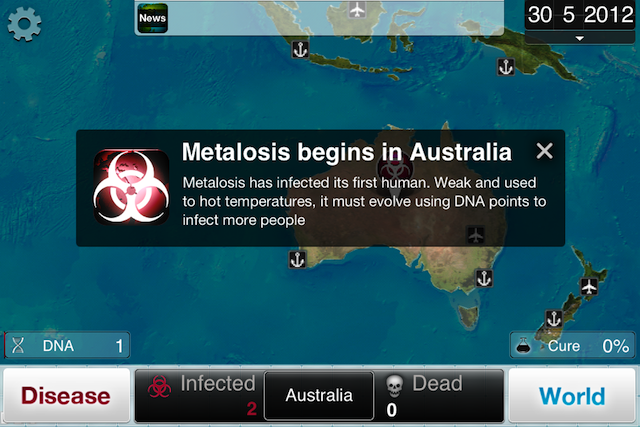 Think of yourself as a destructive super being as you create, mutate and strengthen your infectious weapon. 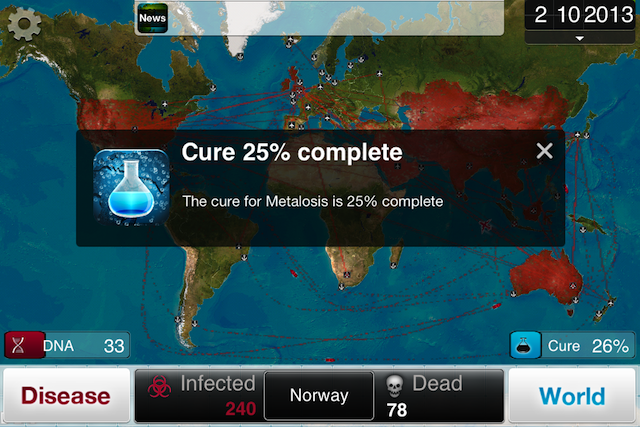 Players start by naming their disease. Some clever ideas would be to name it after a mythological god, an aggressive music genre, or an ex-boyfriend. 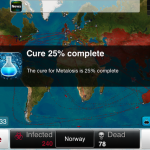 After naming your disease, you will pick the country you want it to begin spreading in. Be careful not to pick a country that has a lot of wealth and resources. 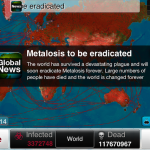 Once the public catches on to the spread, research will begin and it will become harder for the disease to kill all of humanity. 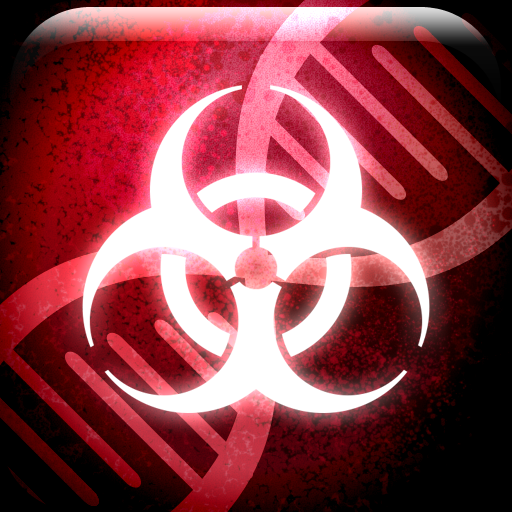 As the disease spreads, players collect DNA that they use to strengthen its abilities. 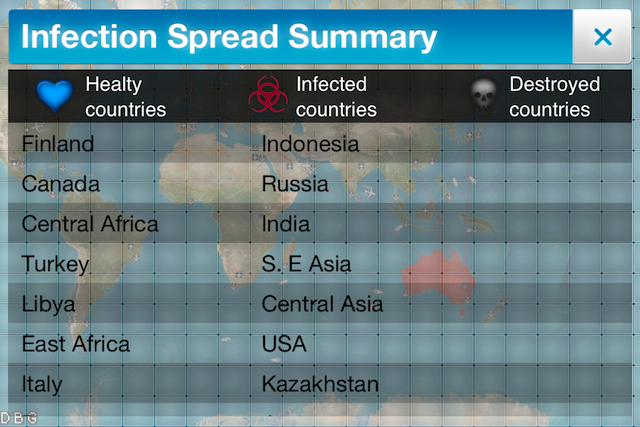 Increase its ability to spread by adding ways that it can be transmitted. 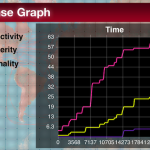 For example, you can add airborne and waterborne in the disease transmission section to watch the ailment spread around the globe at a rapid pace. The speed at which the disease spreads will increase with each new way to transmit. 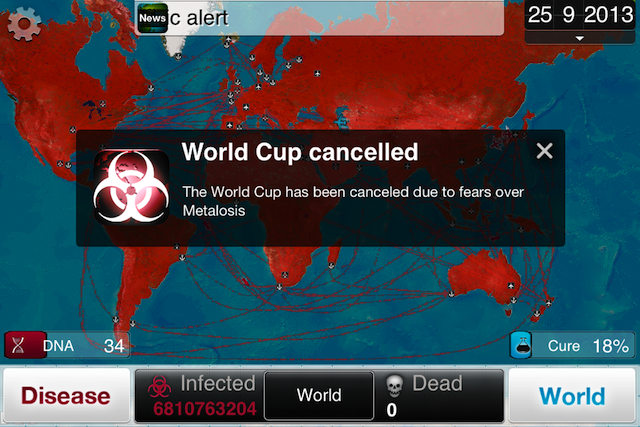 Players can also determine how sick and how noticeable a disease becomes over time. You can spread the sickness far by not making it lethal. 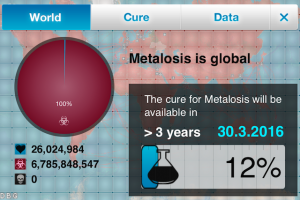 However, the point of the game is to kill everyone, so a non-lethal disease will eventually be easily cured. The strength of the disease and inability to cure it is determined by its abilities. Players can increase its severity by making it more resistant to certain types of weather, or by having it become more resistant to drug treatment. The type of disease, its severity and lethality must be balanced well. If you create a disease that kills people off at a rapid pace, it will become “scary” and the world’s researchers will work harder to find a cure. 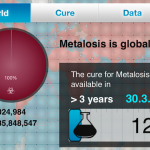 If you get everyone sick but don’t kill them off, you will stop earning DNA points and you won’t be able to mutate your disease into something more lethal. There are three modes of play, casual, normal and brutal. 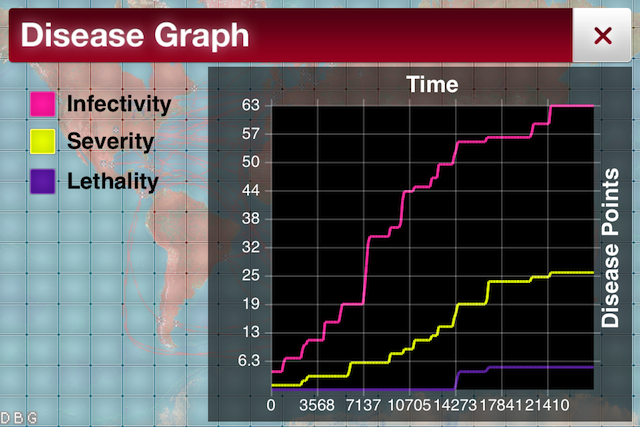 Each mode adds a difficulty factor for spread ability and research. 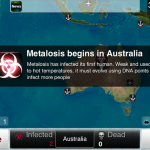 There are also seven regular disease types that can be unlocked when previous diseases wipe out the earth. 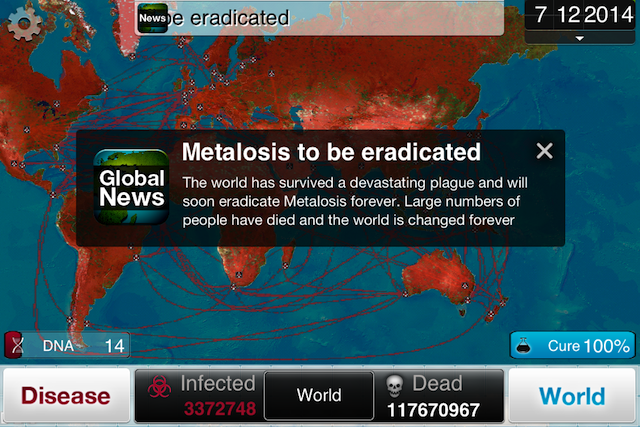 For example, You can’t spread a parasite until you’ve won the game playing with a fungus. When you beat the entire game on brutal, you unlock three special cheats. 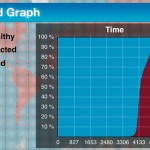 There is a terrible bug in this game that causes it to crash unexpectedly. I played the game on a fourth generation iPod touch running iOS 5.1.1 and every time I played the game, it would crash on me a couple of times. 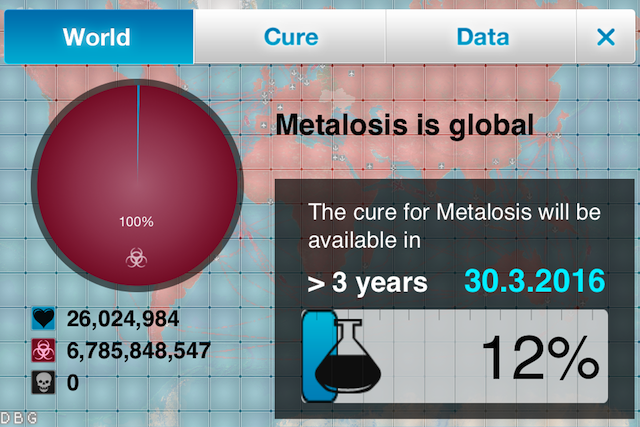 This is especially irritating because the game is based on time and progression of the disease. If you didn’t save the game recently, you will lose all of the progress you earned up until that point. 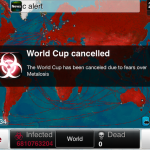 More than once, I was getting close to a widespread pandemic and would be back to only a small percentage of a population infected because the game would crash on me. Other than the crashing issue, this game is a tremendous amount of fun. 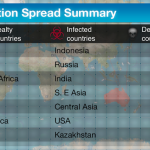 You have to learn how to spread your disease without the recipients becoming suspicious of the ailment. 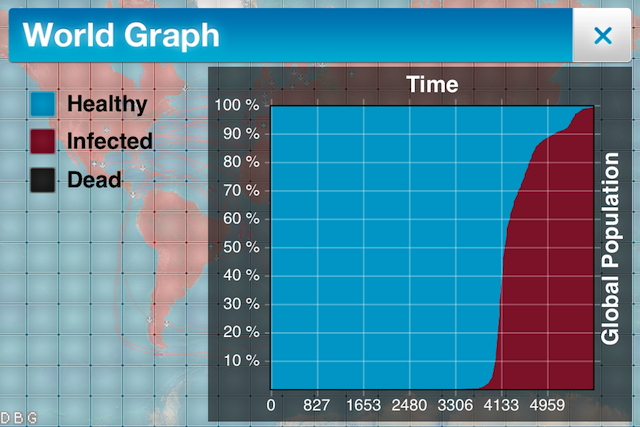 There are three different levels of difficulty, so once you get good at killing the entire human race in one mode, you can move on to something harder. Unfortunately, the crashing problem makes it hard for me to recommend this game. My hope is that players using a different device, like the iPhone 4 or 4S don’t experience this issue. 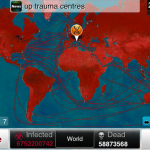 If you like pandemic type disease-spreading strategy games, this may be for you. Just be warned that the game crashes on iPod touch devices running iOS 5.1.1.